The XTENDEX® 4K HDMI USB KVM Extender via Fiber provides remote KVM (USB keyboard, USB mouse and 4Kx2K UHD HDMI monitor) access to a USB computer up to 4,590 feet (1400 meters) away via a duplex LC fiber optic cable. 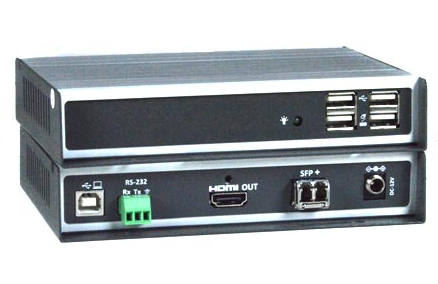 Each KVM extender consists of a local unit that connects to a computer, and a remote unit that connects to a keyboard, monitor and mouse. Uncompressed signal transmission via two-strand singlemode or multimode LC fiber optic cable. Using multimode cable, extend to 984 feet (300 meters). Storage temperature: -40 to 212°F (-40 to 100°C). 4,590 feet (1400 meters) over 9µm singlemode duplex LC fiber optic cable. 984 feet (300 meters) over 50µm multimode LC duplex fiber optic cable. The use of fiber couplers with ST-FOUSB4K-LC is not recommended since it operates using high bandwidth (10G SFP+) – straight fiber runs should be used. Use a FIBER-D-LCLC-50-xxM duplex multimode LC 50-micron fiber optic cable to extend the receiver from the transmitter up to 984 feet (300 meters).